Due to technical glitches that caused the IRS site to crash just hours before the tax-filing deadline, taxpayers got an extra day to file returns. Even without an IRS meltdown, lots of us file tax extensions this time year. But imagine if we could file for a different type of extension to get a little extra time out of our beauty routine. You can get more time out of your hair color, blowout, Botox treatments, manicures and even outdated winter cosmetics. Think of how much time and money you could save by skipping the occasional appointment. These hacks and pro tricks will make your bottom line look good. And both you - and your taxes - will thank me! 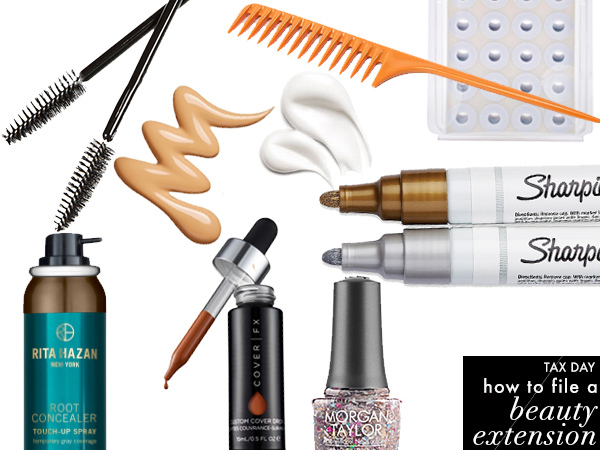 Here are the best ways to file for a beauty extension on your taxes. Extend the Life of Your Botox. I would do almost anything in the name of beauty research, but self-injecting Botox is not one of them. That said, I love finding a great product that can mimic the effects of dermatological treatments, even temporarily. Enter SkinMedica TNS Essential Serum. You may already be familiar with hyaluronic acid's ability to moisturize and plump skin, but when combined with gamma aminobutyric acid (or GABA), you get a tightening and freezing effect similar to what occurs following Botox injections. Combine that this serum's collagen-stimulating peptides, and you've got a topical product that works overtime to fill in fine lines and wrinkles. Before you balk at the hefty $281 price tag, it's a total bargain compared to $860 it will cost you to get Botox in your frown lines, crow's feet and forehead furrows. As the weather gets warmer this time of year, we tend to opt for deeper foundation shades. But who wants to waste that bottle of your favorite prestige foundation? I would sit shiva and go into mourning for my Giorgio Armani Luminous Silk Foundation if I had to toss it every spring. Instead, I mix a few drops of darker pigmented Cover FX Custom Cover Drops to customize my desired shade. It does wonders when I self-tan, because my complexion could be four different shades in one week. If you want to go more luminous, mix in a bit of Laura Geller Beauty Dewdreamer Illuminating Drops, too. Make Your Hair Color Last. Celebrity hair colorist Rita Hazan answered everyone's prayers when she invented her Rita Hazan Root Concealer Spray. When you start to see root growth, you can skip a trip to the colorist and milk an extra few weeks out of your $500 double-process color, covering up grays or adding in highlights with this easy-to-use, spray-on color that comes in a range of light and dark shades. Women tend to color their hair six to eight times a year, so you can spread those out and save $$$ by scheduling fewer appointments throughout the year. Consider it money in the bank. Prolong a Good Hair Day. I love myself a good Drybar blowout, but who has time to sit in the hairstylist's chair multiple times a week? The best thing to do is to avoid those dry shampoos and hair powders, which leave your roots looking powdery or waxy. The best way to prolong the life of your hairstyle (and skip a shampoo) is to blot your roots with Thayers Witch Hazel Alcohol-Free Mist, which soaks up the oils without drying out your scalp or hair. Bonus: It comes in naturally scented cucumber, rose or lavender, which can help eliminate dirty-hair stench. (Check out these other uses for witch hazel.) Use a fine-tooth rat tail comb like this $1 option to part your hair one section at a time, then dip a disposable mascara spoolie brush in the witch hazel and gently stroke it from scalp at your part to about 2 inches down the hair shaft. It evaporates quickly, so you can move onto the next section. Another great secret if your hair is extra-dirty: shampoo just the front section of your hair, from ear to ear. Put the rest of your hair back in a bun, put on a stretchy headband and shower cap to protect the back section. Then shampoo and blow out just the front section. It will make the entire blowout feel clean and fresh again. I call this "ring around the nail bed." It's that skinny sliver of bare nail that appears at the base of your nails as the manicure grows out. The best solution: turn it into nail art so simple, you can do it at your desk. It's so simple, even a beauty klutz like me can pull this off. Place a binder reinforcement sticker (remember those, 80s kids?) 1/4-inch up from your nailbed, creating a confined area that protects the rest of the nail. Then stroke on a multi-dimensional glitter polish like Morgan Taylor Nail Polish in Over the Top Pop to cover the new nail growth. 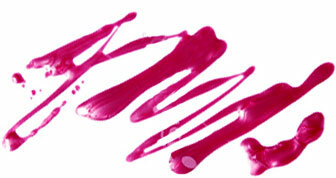 Caution: Using a regular glossy shade won't work, because it will show the edge where your old mani ends. When the glitter polish dries, remove the sticker and apply a layer of clear top coat. For chipped manicures, you can create goof-proof metallic accents, dots or lines to distract the eye. I love these basic Sharpie Metallic Paint Markers from the hardware store. You can't go wrong! Turn Your Lipstick into Longwear Stain.